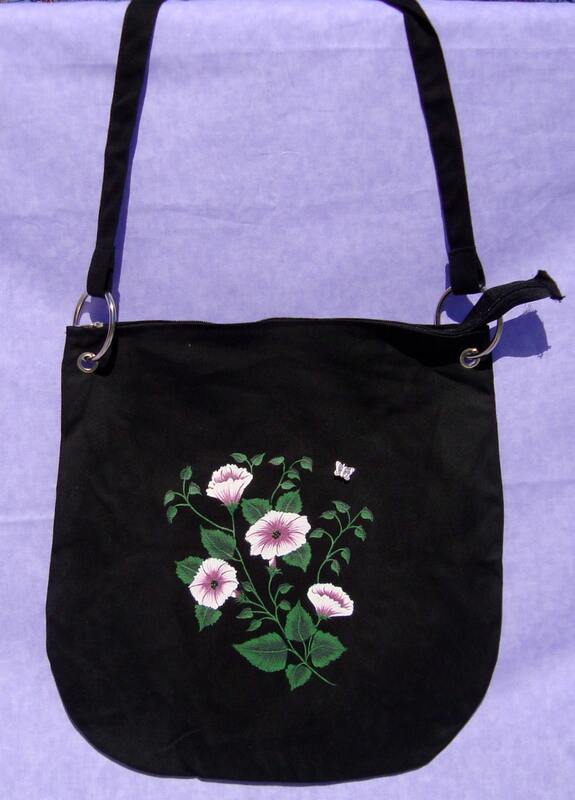 This is a hand painted, distressed black messenger bag with pink and white flowers. It has green leaves and vines. The centers of the flowers are decorated with hand sewn seed beads. It also sports a silver butterfly charm for extra sparkle. It has a small zippered compartment that would be perfect for keys or money. This is a roomy bag that can be used to carry anything. It would make a great gift or a treat for yourself. It's a versatile accessory that you will find yourself going back to again and again. I used acrylic paint mixed with a textile medium. It was air cured for 48 hours and then I heat set the paint to ensure longevity. The centers of the flowers are embellished with hand sewn 10/0 seed beads. The butterfly charm is hand sewn onto the bag.